Do you have a question? A special request? Would you like to place an order? Call 1-800-769-1147 to speak with a customer service agent. In straightforward language that is clear and dignified, this new 384-page book offers hundreds of traditional and contemporary blessings and ritual prayers, suitable for all occasions in the life of Christian families and communities. Blessings and Prayers for Home and Family will serve families and small communities in the many events of their lives. It will be useful for marking milestones, such as weddings or the birth or adoption of a child, for celebrating important family rituals, such as birthdays or anniversaries, and for offering solace in times of sorrow. The range of blessings in this collection underscores the holiness of the daily activities of all members of the family, whether at work, school or home. It touches on everything from farming and fishing, to computers and family pets. The book also includes the very beautiful basic and traditional prayers, such as grace before and after meals, creeds, litanies, the Rosary and Way of the Cross. An essential book for every home, this rich resource will help families and community members celebrate the day-to-day experiences of life together in a spirit of sharing and love. Many of the prayers and blessings in this book transcend denominational boundaries, and will appeal to adults and children alike. For parents, this book will impart a habit that will sustain, comfort and guide children throughout their lives. Although it is designed primarily for family and small-community gatherings, it will serve as a valuable guide to all those called to perform blessings as part of their ministry. 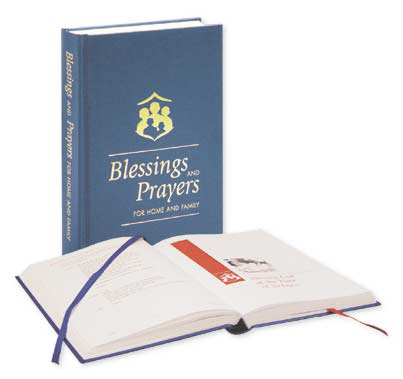 Some of the prayers in the book also make a useful resource in various liturgical settings. Teachers and students will find the sections on confirmation and first Communion helpful as prayers for the classroom, especially with candidates for these sacraments. The introduction contains practical suggestions for individuals, families and groups on how to use the resource. Texts are gathered around themes (for example, "Comings and Goings," with blessings for moving, leaving on pilgrimage, or returning from a trip) and outline a simple order of prayer, suitable for one person alone or for several family or community members praying together. Adaptability and flexibility were considered throughout the preparation of the book. The models presented can easily be adapted, for example, by changing singular to plural, revising words or phrases, or selecting other readings or arrangements. Prayers may be shortened by leaving out some sentences or lengthened by adding others. A reflection may be made by the leader or others present, or further intentions added to the litanies. Designed for real-life situations at home, at work, in the parish or in the community, Blessings and Prayers for Home and Family makes an ideal gift for Christmas, weddings, anniversaries, birthdays, and other celebrations or events. It would be a valuable resource for adult faith groups, sacramental preparation classes, marriage encounter groups, and other parish and community groups. A dedication page allows you to write a personal word to the one to whom you offer the book. Blessings and Prayers for Home and Family is available in softcover and hardcover editions. Both editions are set in highly readable two-colour text. The hardcover edition features two ribbons to mark favourite passages. Its handsome cover and strong binding make the book a particularly beautiful gift that will serve generations.